I can't resist posting news about tabletop Cthulhu gaming - this time it's Achtung! Cthulhu, which is currently having a very successful Kickstarter, reaching its goal of £8,000 in just 26 hours. Now publisher Modiphius Entertainment is gathering funding for a full campaign for the game called Assault on the Mountains of Madness, using stretch goals. “This is going to be the ultimate Achtung! Cthulhu wartime campaign, with something for everyone whether it’s fighting Nazis and ancient horrors in ice locked ruins, or racing for time to decipher otherworldly mysteries. You’ll have your frozen hands full getting to grips with the enormity of the adventure ahead, and trust me it is going to be our biggest release yet, which you can unlock along with a ton of accessories over the coming weeks”. Chris Birch, Modiphius Entertainment. Does that sound awesome or what? According to Modiphius, in Achtung! Cthulhu: Assault on the Mountains of Madness, following a trail of strange events, and clues to an ill-fate earlier expedition, the Allies will discover an Antarctic infested with Nazis. They must launch themselves into the frozen continent where they’ll be faced with the power of the elements, unbelievable ancient mysteries and a stunning climax that could change the face of the world forever. Designed for gamers who like in depth mystery, investigation and cataclysmic events, the campaign can easily be tailored for both dark, classic Call of Cthulhu play as well as the pulpier Savage Worlds experience, and is compatible with both systems. The campaign will come with extensive cartography by Michal E. Cross whose sterling map work has made such a success of the Achtung! Cthulhu line. Achtung! 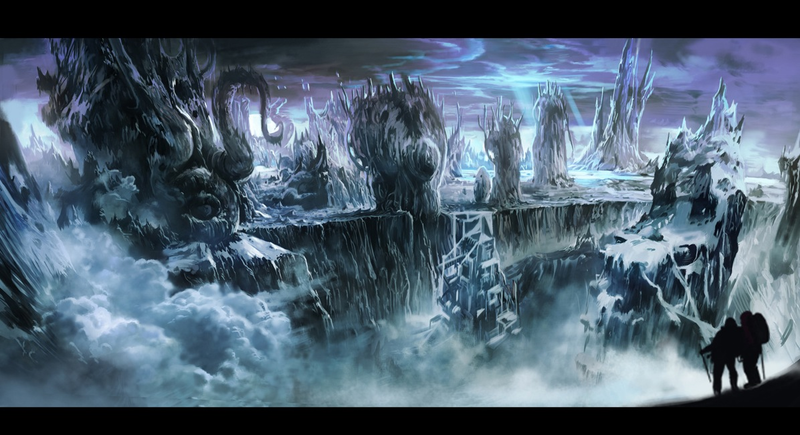 Cthulhu : Assault on the Mountains of Madness is being illustrated by special guest artist Korungn from Japan. Korungn has already created a library of stunning and evocative movie style concept art for the setting, which will be revealed week by week. Check out some of the amazing artwork you can expect to see from the campaign book below.